Celtic and Rangers fought out a thrilling Scottish Cup game at Ibrox on Sunday. There were numerous interesting tactical changes from both sides throughout, as well as plenty excitement in front of a typically raucous crowd. Celtic began the game with a couple of changes to the team sheet, the first being the return of Daniel Majstorovic to the centre of defence, allowing Mark Wilson to move back to right-back with Efrain Juarez dropping out. The more interesting change was further forward with Anthony Stokes sacrificed in favour of Ki Sung-Yong, back from international duty with South Korea in the Asian Cup. This meant a change in formation from the previous five games from 4-4-2 to something approaching a 4-1-4-1, with Kris Commons starting on the left, Scott Brown on the right and Gary Hooper given the nod as the lone forward. Ki formed a midfield trio with Joe Ledley and Beram Kayal, the Israeli given a traditional ‘holding role’ while the other two were slightly more advanced. Rangers took to the field with a 4-4-1-1 formation, with the charming El Hadji Diouf in front of a midfield four of – from left to right – Naismith, Ness, Edu and Davis and behind the lone forward, Nikica Jelavic. 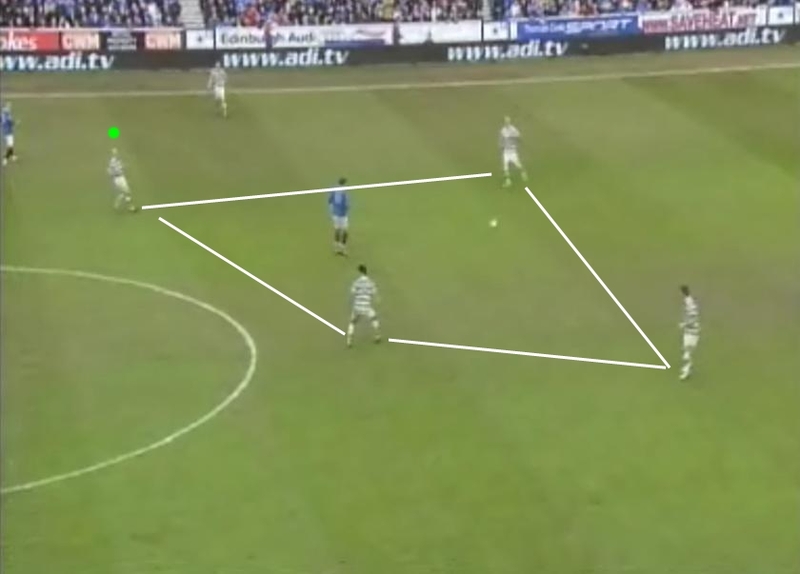 This midfield setup was basically a mirror image of Celtic’s, with Diouf able to apply pressure to Kayal and the opposing sets of four cancelling each other out. This gave the Celtic centre-backs no easy out-ball, which Rangers cleverly compounded by having each of their midfielders track their opposite man as he came short to collect the ball. This led to Majstorovic and Mulgrew nervously passing the ball between them until one would hit a hopeful long ball towards Hooper, who had little chance in an aerial battle against the home sides’ defence. 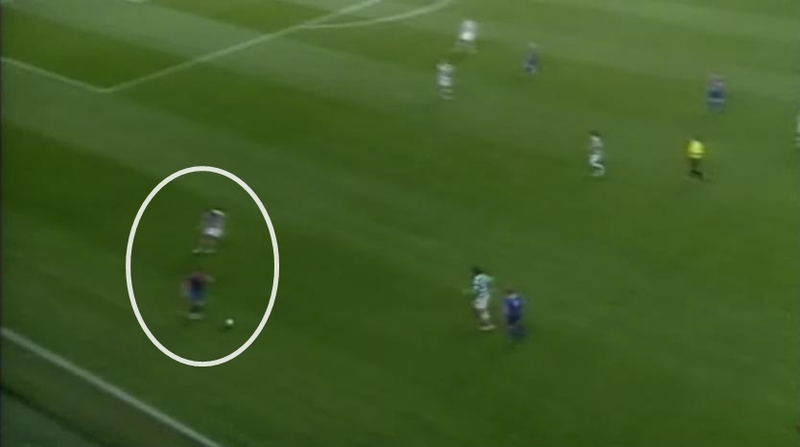 Hooper was also quite isolated, with a big gap between himself and the Celtic midfield and this caused him to come deep in search of the ball where he can offer little threat to the opposition goal. 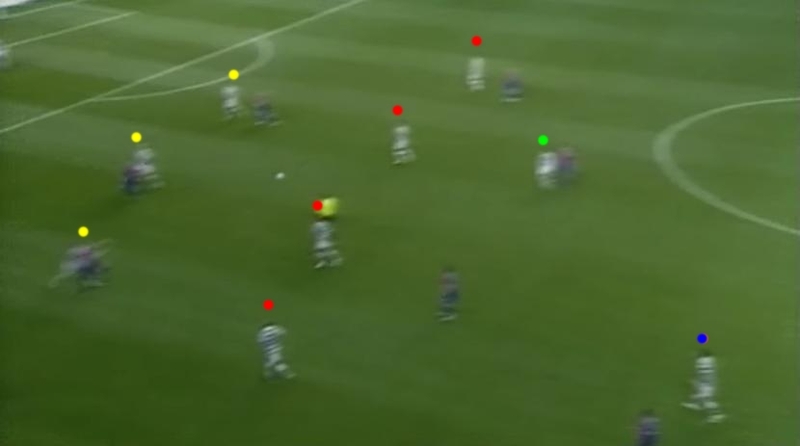 As the ball is hit forward to Hooper (green) he is out numbered by his more aerially dominant Rangers opponents. Also notice how far from the opposition goal Hooper is. Following long-balls from their defence towards Jelavic to gain field position, Rangers were able to keep Celtic pegged back by setting up in this way and took advantage early on through a resultant corner kick. After the ball was half-cleared, promising youngster Jamie Ness fired them into the lead in with a fantastic strike. The switch to two holding players gave Celtic a four man box – Majstorovic, Mulgrew, Kayal and Ki – who were able to comfortably pass the ball around the Rangers pair of Diouf and Jelavic – a 4 v. 2 situation. The centre-backs could now pass the ball out of defence rather than be forced to go long. 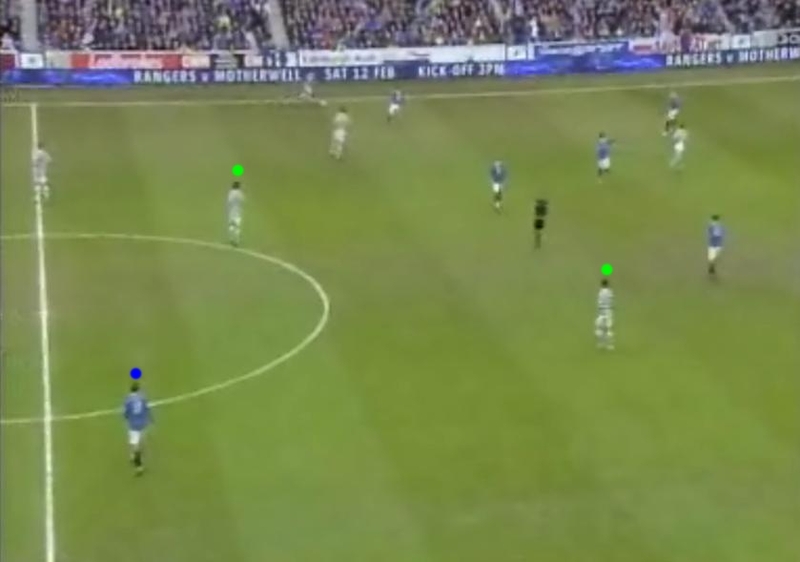 Beforehand, Rangers had no opposition player operating between their midfield and defence and found it easy to deal with the isolated Gary Hooper. With Commons now here, the Rangers midfield had an extra threat to worry about behind them, without which they may have still been able to close off Celtic’s new deep passing options of Ki and Kayal. 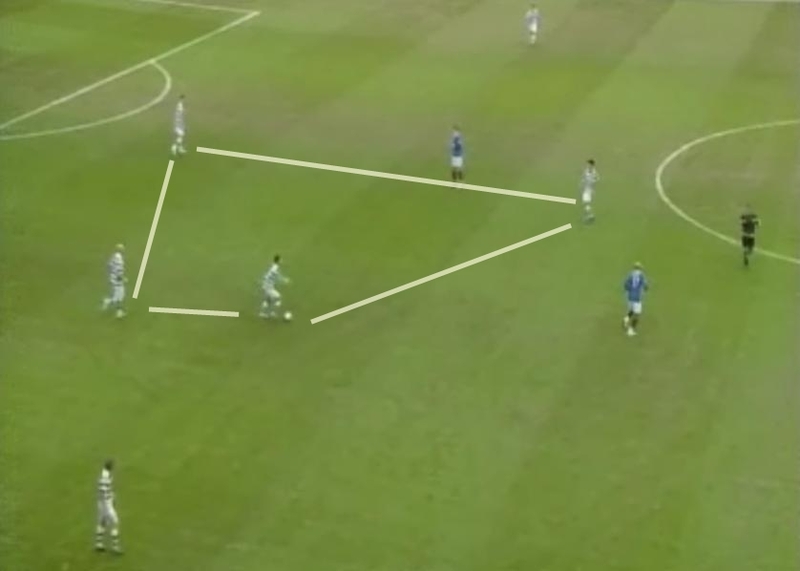 Common’s clever movement ‘between the lines’ caused the Rangers midfield to drop back and stay close to their defence in an attempt minimise space. This not only helped contribute to the above 4 v. 2 situation but also allowed Ki and Kayal – who enjoyed a 2 v. 1 against Diouf – to comfortably carry the ball into the Rangers half. In addition, Celtic had the potential to create a 2 v. 2 involving Commons and Hooper against Bougherra and Weir – a dangerous situation for a defending side. As well as the uncertainty created by his clever movement between the lines, Commons’ positional switch allowed Hooper to play on the shoulder of the Rangers’ defence. His superior pace was no doubt a worry for them and so they retreated closer to their own goal and – for the reason discussed above (Commons’ movement) – took their midfield with them. Again, this helped with the 4 v. 2 and 2 v. 1 situations already discussed. In addition, Celtic’s own midfield could push further forward, closer to Hooper and to the Rangers’ goal. Ledley, Brown and Commons could make attacking runs into the box from higher starting positions. As Rangers dropped deeper, they also got narrower. This, coupled with Celtic pushing forward, meant that not only was there more room for the Celtic fullbacks to exploit, but they were starting their forward runs from more advanced positions. Both Emilio and Wilson overlapped tirelessly. Rangers deep and narrow. Gives a high starting position for Emilio (yellow) and lots of space in front of him (yellow area). 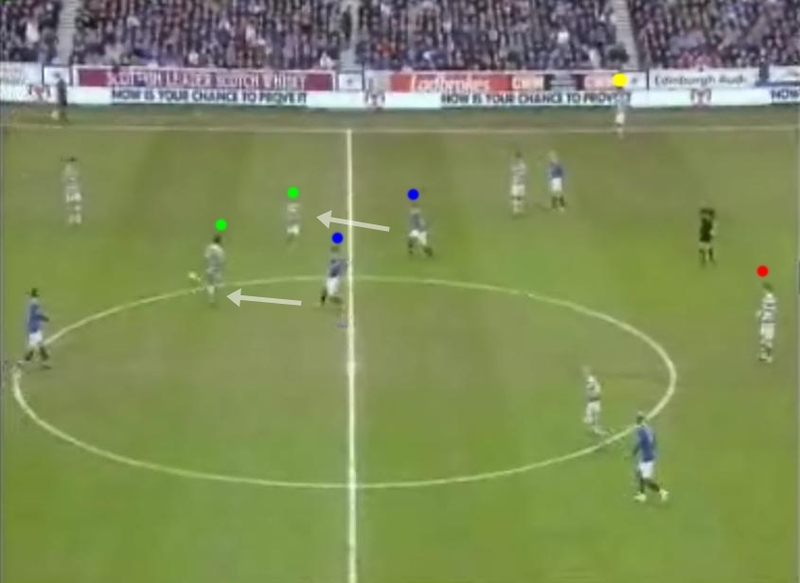 The Kayal and Ki (green) v. Diouf (blue) situation can be seen again too. The changes described above, that resulted from Lennon’s tactical reshuffle, all combined in the lead up to Celtic’s equaliser. 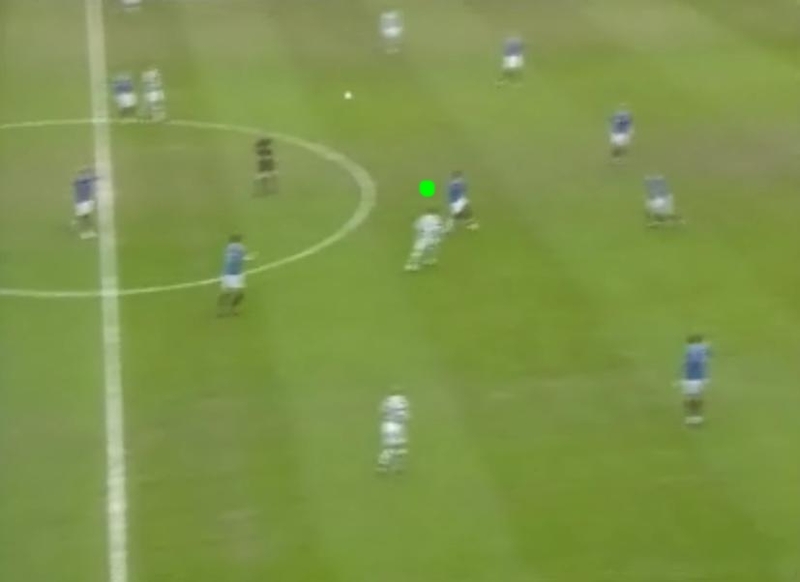 Kayal and Ki brought the ball into the Rangers half and the Korean layed the ball left to Emilio Izaguirre, now able to take up an advanced position and in a decent amount of space. 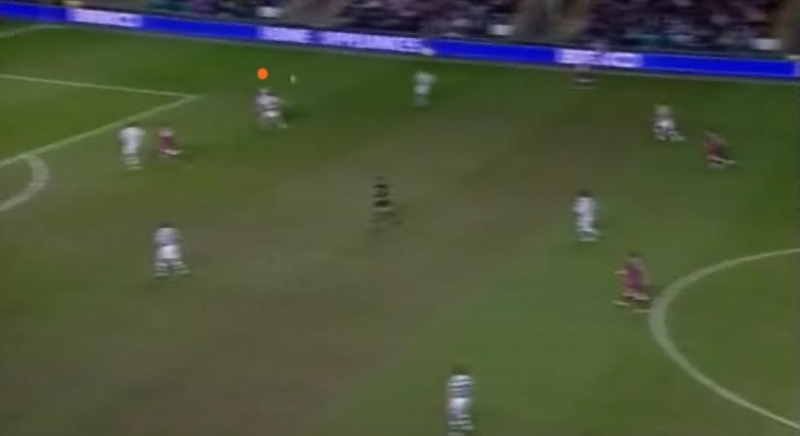 His attempted through ball deflected into the path of Joe Ledley, who had made a run into the penalty box. The Welshman pulled it back for Commons’ – whose tricky movement had eluded any Rangers marker – to arrive late in the area and score. Perhaps the injured Lee McCulloch would have provided better protection than Ness or Edu, with Walter Smith alluding to the problems created by McCulloch’s absence after the match. “I don’t think there’s any doubt we missed Lee at the weekend and the stability he provides. If you were looking at him over the period, I think he was heading towards being our Player of the Year this term. Maurice Edu and Jamie Ness are different types of players but we’ll have to try to cover that area if we are to be without Lee, ” Smith said. Celtic were well in control, with the stats now regularly showing figures approaching a staggering 70% in their favour. Jelavic was now receiving high balls much further away from Celtic’s goal, and he generally looked very uncomfortable when in possession in these much less threatening areas. The home side were being totally outplayed and so Smith was forced into a change. Just as at the beginning of the game, he re-shaped his side’s midfield so that it mirrored Celtic’s. 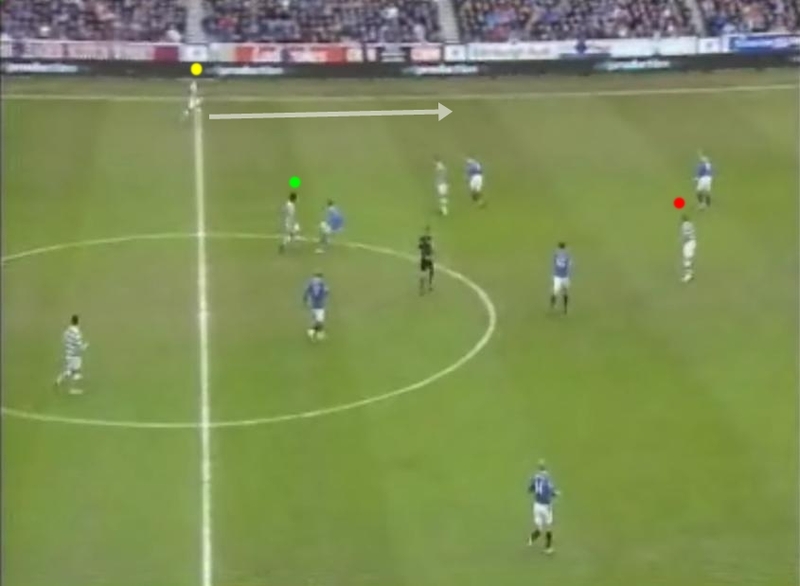 Davis and Ness were moved into advanced central positions, closer to the Celtic pair of Kayal and Ki while Diouf and Naismith moved to the left and rightt respectively. Maurice Edu dropped into a holding role in front of the Rangers defence, meaning he could track Commons’ runs and also limit the potential of a Commons- Hooper v. Bougherra-Weir 2 v. 2. 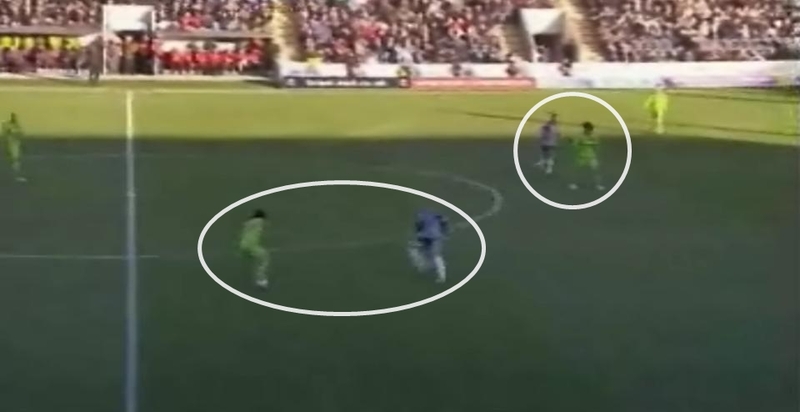 As the picture shows, Kayal and Ki were now under more pressure and their defence – with the fullbacks pushing forward – are in a more precarious position should possession be lost. This eventually happened and it is what led to the Rangers penalty. Commons lost the ball in midfield with the Celtic centre-backs exposed due to the forward runs of their fullbacks. 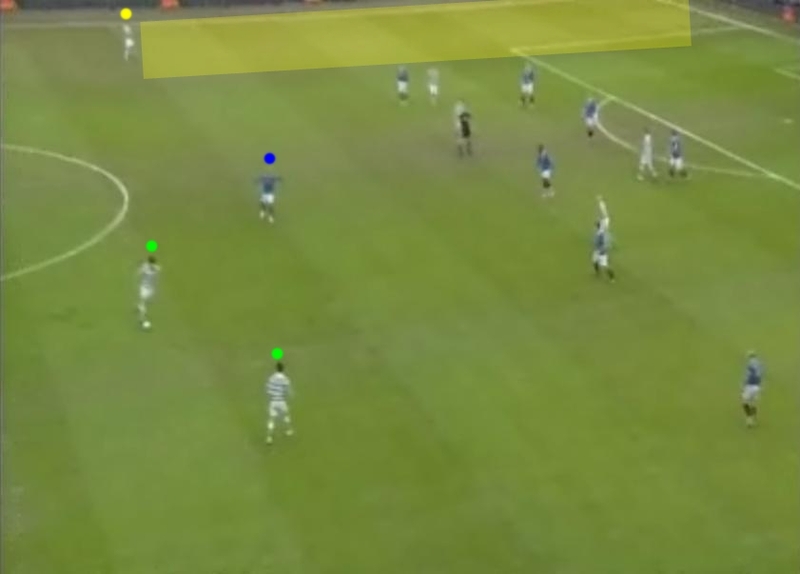 The two centre-backs were left to cover the width of the field and gradually parted, leaving a space in the middle for Naismith to dart into and his run was found by Jelavic’s through-ball. He was through on goal and was brought down by Fraser Forster – who was sent off for the challenge – in the area and Whittaker stuck away the resultant penalty. It was a good example of how Celtic still have it within themselves to be their own worst enemy at times. Kris Commons was the outfielder sacrificed so that Celtic could bring on substitute goalkeeper, Lukasz Zaluska, meaning an enforced switch in formation to 4-4-1 and they managed to keep the score at 2-1 against a rejuvenated Rangers until half-time. Rangers took to the field for the second half in the same way that they ended the first. In typical Smith fashion, they looked to hold their lead and continued to defend deep and narrow, with the same lineup and formation. Celtic kept the same set of players and formation as well, but now with a noticeably greater flexibility to its shape, both with and without the ball. These changes were clearly the result of half-time instructions from the management team. When defending deep, they lined up in two banks of four – with Hooper staying up or occasionally dropping back to help out – and kept compact and narrow as a unit. Rangers’ conservative nature and intention to hold onto their lead meant that they only ever had a maximum of five players in attack against Celtic’s eight in defence. Therefore, Celtic were largely comfortable when defending deep. Celtic's compact and narrow '2 banks of 4'. Rangers only have 5 men in Celtic's half. 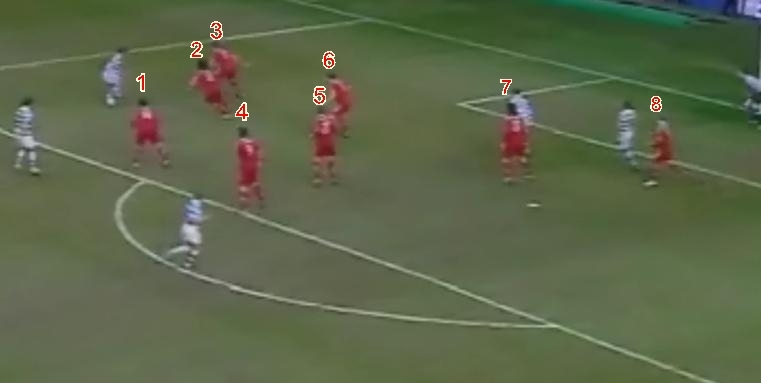 Diagram 1: Celtic's 10-man high pressing when ball was on left. This way, Celtic were able to retain the same amount of pressure as a side with eleven players. When in possession Celtic’s midfield stayed narrow with width provided by the fullbacks, much in the same way as we saw in the first half. They were up against a Rangers side largely intent on sitting back in numbers, keeping to their 4-1-4-1 formation and defending deep and narrow. So again, Wilson and Emilio had space to move into and advanced positions from which to start their attacking runs. Their tireless overlapping allowed Celtic to create a 6 v. 5 situation in midfield (sometimes a 7 v. 5 when Hooper dropped deep) and was a large contributing factor to Celtic’s dominance in possession (which continued to approach 70%). When both went forward it left two (Majstorovic and Mulgrew) in Celtic’s back-line but this wasn’t that much of a risk due to Rangers’ negativity, with the pair up against an isolated Jelavic, who was often a long way from his midfield as well as the Celtic goal. He had a difficult job and must get some credit for occasionally posing a threat single-handedly. Rangers deep and narrow, with Jelavic (off screen) a long way from his team mates. Lots of space on flanks for Emilio (yellow) and Wilson (green). In addition to the width provided by the fullbacks, Celtic’s midfield were very fluid, with a lot of off-the-ball movement and position switching. This provided the ball carrier with number of passing options and is another reason for Celtic keeping hold of the ball so well. It is an interesting development to see a midfield containing what are essentially four central midfielders play in this way, with each always looking for a pass rather than the ‘head down and run’ approach employed by some of our wingers. An example of Celtic's midfield fluidity, position switching and passing angles. Despite this dominance in possession, Celtic – whilst looking threatening – were finding it difficult to carve open the Rangers defence. When the fullbacks got into good crossing positions there was often only an outnumbered Hooper to aim for in the penalty area. He needed more support up front and so on the hour mark, Giorgios Samaras was introduced in place of Beram Kayal. It seemed a risky move but it was a necessary one and it meant another change in formation to Lennon’s side, to something approaching a 4-3-1-1. Samaras went up front to spear-head Celtic’s attack, while Hooper dropped in just behind him, with Ledley, Ki and Brown forming a midfield trio and the back four staying the same. Wilson and Emilio continued to provided width up and down the flanks. Celtic started to press higher more frequently, in similar fashion to that shown in Diagram 1 & 2, but now with more players committed into Rangers’ half. ... and here when the ball is on the right. The substitution meant Ledley and Brown had larger areas to cover in attack and defence and the pair dealt with the extra workload admirably. In particular Brown, who also now took over Kayal’s role of forming the ‘box’ with Ki, Mulgrew and Majstorovic. He was practically playing the role of two players and showed fantastic energy levels to cover the large distances in order to do so. Samaras’ introduction meant Celtic now had an aerial presence – with a better target in the box and with Hooper now able to run onto his flick-ons – and more pace to worry the comparatively slow Rangers’ defence. Perhaps having flashbacks to the torment he caused in the Ne’erday Derby, the Rangers’ defence retreated further towards their own goal and invited even more pressure from Celtic. 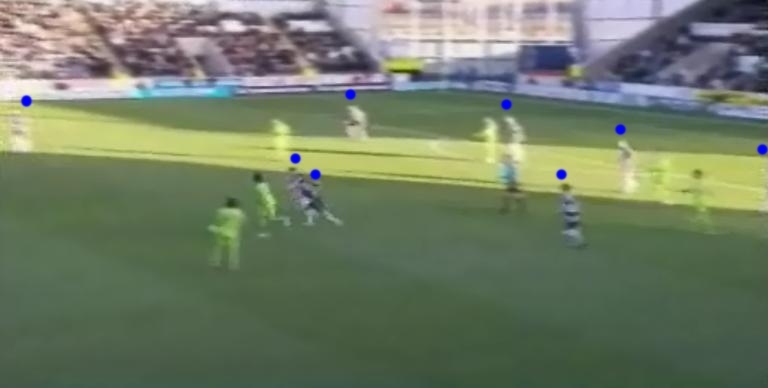 This culminated in Emilio taking advantage of the increasing space on the flanks before putting a cross which was half cleared, possibly due to the added physical presence of Samaras. Rangers’ were so defensive now that they had eight players in their own penalty box but neglected to pick up Brown, who was free on the edge of the box. The ball was eventually worked out him and he had time to pick his spot, curling a left-footed shot into the far left corner. It was an excellent strike and if anybody deserved a goal based on their performance, it was the captain. Celtic continued to dominate and go in search of a winning goal, which they may have got had Samaras not incorrectly been ruled out for offside when through on goal. His introduction did allow Celtic to pose more of a threat in attack but also meant they were more open defensively, with the centre-backs now receiving less protection due to the departure of Kayal. This meant that when Celtic lost the ball, Rangers were able to threaten through quick breaks involving their quicker players, such as Steven Naismith. However, one of these occasions that he found himself in an advanced position, he shamelessy dived to the ground in search of another penalty. The referee rightly awarded him his second yellow card – the first for a reckless tackle – and the Scotland international was given his marching orders. Rangers’ responded by introducing Vladimir Weiss and Kyle Lafferty in place of Diouf and Jelavic respectively, but these substitutions did little to alter their game-plan. They switched to a 4-4-1 formation – though a far more defensive minded one than Celtic’s – with Weiss going to the left-wing and Lafferty taking over the role as the lone front-man. Aside from one break where Weiss’ long range shot troubled Zaluska, Rangers were intent on keeping the score at 2-2, and managed to hold out for the rest of the game. They say familiarity breeds contempt but some of the Celtic contingent must be wishing they could play Aberdeen every week. Three match ups in ten days at three different venues resulted in three Celtic victories, with eight goals scored and one against (1-0, 4-1 and 3-0). While Celtic have been fairly consistent with tactics and team selection – aside from the odd personnel change – ‘Dons boss Craig Brown tried and failed with three different strategies to stop the men in green and white. Interestingly, Aberdeen’s ‘best’ result came at Celtic Park, probably because they were rank outsiders and knew they had to come and shut up shop. Without the ball – which was most the game – they lined up in a straightforward 4-4-2, defended deep and looked to restrict the space between their midfield and back four. They did this well, managing to frustrate Celtic for the majority of the game and continued in this vein even when losing – perhaps with the notion that if you stay within a goal, you still have a chance. Fortunately for Celtic, they stuck to these instructions too stringently at times which is what led to the home side taking the lead. Defending too deeply and with the midfield close, there was a lot of space for Celtic to play in front of them but still be a threat. 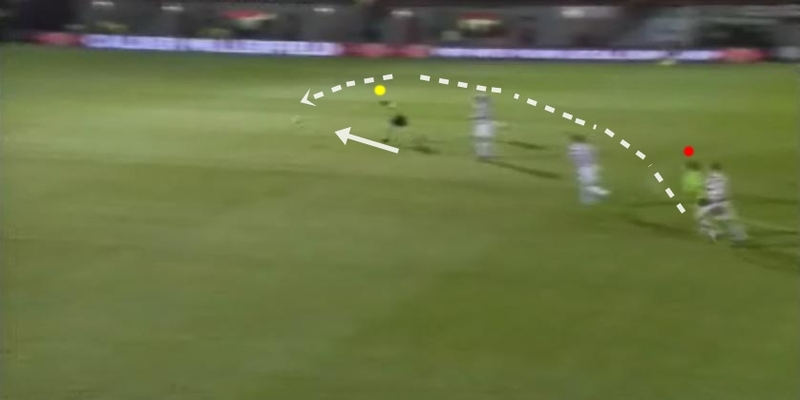 Hooper was able to drop into a huge space in this area – as opposed to between the defence and midfield – before swiftly picking out the run of Stokes behind the away side’s back line. For Celtic, this is one of the benefits of playing at home on a large pitch, much larger than anything they will have been used to in preparation for the game. This inadequate protection of the defence was to become a recurring theme for Aberdeen in the subsequent games, the next meeting – the 4-1 hammering at Hampden in the CIS Cup semi-final – a perfect example. Three of the Celtic goals came from corners – two directly, one indirectly with piece of brilliance – and this is a result of defending in the way described above. When a side does so, it is common for last ditch blocks, tackles and clearances to result in the giving away of corners due to their proximity to the byline. Celtic took full advantage. Aside from this inability to defend corners, Craig Brown must also have been concerned that his side also went to the other extreme. On numerous occasions the midfield was caught too far away from their defence – the opposite problem from above – giving Celtic space to play in ‘between the lines’ and this indiscipline should have led to the Hoops adding to their score. The game also saw a change in formation for Aberdeen to a 5-3-2, but we basically saw the same problem of eight players forced back close to their own penalty box, detached from their front two. They were also weakened by the loss of forward Nick Blackman, whose pace and runs into the channels after balls over the Celtic defence were the only real threat in the game at Celtic Park. Despite the change in formation not necessarily being the main cause for going four-nil down, the half-hour capitulation was enough to prompt Brown to switch back to 4-4-2. The second half saw a flat performance from Celtic and this, coupled with the injury enforced switch to four full-backs in the back four, perhaps allowed Aberdeen to pull one back. One wonders if Vernon would have been able to head home so comfortably had the likes of Rogne or Majstorovic been available. Another meeting between these two sides, another venue and this time it was Celtic who were on their travels as they went up to Pittodrie to face an Aberdeen side intent on revenge. “It is not a case of being sick of the sight of them – this time we want to get a result. We want to make sure we go out and give them more of a game on Tuesday and make sure we do not start the way we did on Saturday,” said Dons midfielder, Rob Milsom, in the lead up to the game. Craig Brown reshuffled his pack again, opting this time for a 4-3-3/4-5-1 but these plans were immediately hit a blow in the first minute when his side went down to ten men. Some excellent play by Gary Hooper and a cross-field pass to find Scott Brown saw the latter’s good first touch take him past his marker, Andrew Considine and the ‘Dons left-back was rightly sent off for a tug then a trip when Brown was through on goal. This forced Craig Brown into a switch around with the returning Nick Blackman – who has been selected on the left-wing – moving to the centre to be the focal point of a 4-4-1. As in the Celtic Park game, they looked for him to run the channels in chase of long balls forward over the Celtic defence. Again though, the midfield did their defence little favours and this was largely what led to the opening goal. This time, right-back Ryan Jack was offered no easy out-ball by his overly advanced midfield and his clearance was charged down by Kris Commons. Possession was turned over with Hooper waiting in the gaping space between the Aberdeen midfield – who were slow to retreat – and defence. He was able to comfortably play a one-two with the more advanced Stokes to be faced with a one-on-one and coolly slid the ball past the ‘keeper, Jamie Langfield. It is interesting to see Aberdeen repeatedly make this kind of mistake, with ex-Celtic Paul Hartley – supposedly an experienced holding player – the main culprit each time. After the goal, Aberdeen gave a good account of themselves but succumbed to fatigue and Celtic piling on the pressure. The second half saw Chris Maguire play as the lone forward, with Blackman and Scott Vernon tasked with providing support from the left and right wings respectively. However, their tracking of the continual advancement of the Celtic full-backs – Juarez and Izaguirre – meant they spent most of the time deep in their own half. When Celtic got the second goal the game was effectively over, with the third simply providing further delight for the fantastic travelling support. From Celtic’s point of view, it was three important victories – four if you include the 4-0 win over Hearts – in games billed as tough encounters. This means Celtic go into the cup tie at Ibrox on Sunday in far more confident mood than in the lead up to their last trip there. Charlie Mulgrew continues to surprise and must surely have won over some of the early season doubters – provided he doesn’t play left-back! There have been two noticeable benefits to his deployment at centre-back, the first being that he is a left-footer in the left centre-back slot and the second is his good distribution. If Celtic look to long – either by choice or out of necessity – he has the ability to find forward runs with much greater accuracy than any of Celtic’s natural centre-backs. Kris Commons has made a fantastic start to his Celtic career, slotting almost seamlessly into the starting lineup. He has shown an ability to go past players on the outside or inside, looks comfortable on either foot and is a definite goal threat both with his shots from distance and clever runs behind the defence. In the game at Pittodrie, he was often very close to the front two of Hooper and Stokes, making it almost look like a front three. It was interesting to see this greater fluidity returning to Celtic’s attack in the most recent Aberdeen game – as opposed to the more ‘back-t0-basics’ approach seen so far this year – as they looked to finish the home side off. As the game went on, there was an increasing amount of position switching and players roaming as Celtic tried to carve open a ten-man side who were hanging on. It is good to know that Celtic have this ‘in their locker’ should they need it but one would expect them to continue with the style that has served them so well in recent weeks. The blossoming Hooper and Stokes partnership looks better each time they take to the field together and their growing telepathy and link-up play is a joy to watch at times. They stay close together and are always ‘vertical’ (one deep, one advanced) – an important feature in strike-partnerships – with the first instinct of each to look for the other when receiving the ball. Their exciting dovetailing – reminiscent in style to Man Utd’s Yorke and Cole – is such a pleasure to see and such a rarity in the modern game that their partnership merits it’s own article. Look out for one in the coming weeks. It’s a disappointment that no late reinforcements were brought in as the transfer window was closing – particularly in defence – but the makeshift back-line’s recent displays have been encouraging. Let’s hope they can continue to impress – they’ll need to on Sunday. 2011 Turnaround: What’s behind it? Some of you may remember the article entitled ‘Celtic’s Early Winter Blues’ which discussed Celtic’s poor form in the lead up the Christmas period. At the time, confidence was low and there was a genuine fear from some quarters about the looming game against Rangers. A nervy victory over Motherwell followed injury time winners against St. Johnstone and this did little to dispel ill feeling amongst some of the support. Message boards were rife with pessimism while the bookmakers and media were quick to write Celtic off but Neil Lennon continued to retain a calm public persona. His belief transferred to the players and he got his tactics right as his side went 0n to record an impressive 2-0 victory at Ibrox, the first there since 2008. It was both a more composed and defensively solid looking Celtic and 2011 has so far seen them continue in the same vein, with an increasing ruthlessness culminating in the 4-0 demolition of in form Hearts. So what has changed? One noticeable change from most games earlier in the season has been the use of a deeper defensive line. The centre-backs on Celtic’s books aren’t the quickest and so deploying them closer to their own goal has made life a lot more comfortable for them. There is now little space for fast opposition strikers to work in should they manage to get ‘in behind’, with Fraser Forster enjoying fewer one-on-one situations to deal with. Rangers’ Kenny Miller was unable to use his superior pace and against the comparatively aerially dominant Rogne and Majstorovic he became largely a bystander. Against Hearts, Charlie Mulgrew – a similarly immobile player – was brought in as a makeshift centre-back with fears as to how this would pan out. 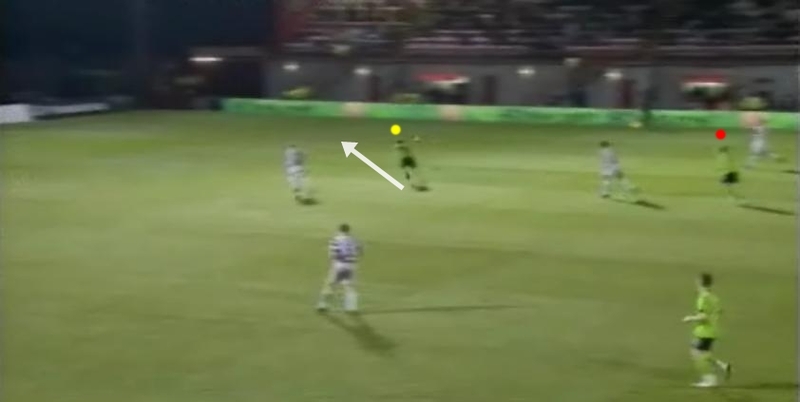 This view wasn’t shared by the coaching staff, with Alan Thompson saying pre-game, “…if Charlie steps in there it won’t be a problem for him.” This confidence in Mulgrew was justified with the defensive line suited to his lack of pace but 6ft4 frame. He and Rogne easily dealt with Hearts’ high forward balls towards Stephen Elliott. Fig.3: 'Defensive block' aggressively press the ball and win it back against Hearts. This goes along well with the way the team appears to more rigid than earlier on in the season. They now deviate from their starting shape far less and this has definitely been a contributing factor towards the number of recent clean sheets. Due to Celtic’s pressing, all season SPL opposition has had trouble playing through the middle but were able to find some joy with balls over the top of the defence or when Celtic were caught out of their defensive shape. Now the deeper defensive line and more rigid set-up means that this is far less of a problem. The aggressive pressing is still there – and it still starts right from the front two – but as unit Celtic begin from further back. There are occasions when Celtic will look to win the ball back deeper into the opponents half but these are dependant the on circumstance. For example, there a number of times where the Hearts defenders gave each other poor, slow passes and there was no easy out ball offered by the midfield. When this happened Celtic would quickly close them down and often won the ball back in very dangerous positions. This shows good anticipation and awareness from the Celtic forwards – the players normally tasked with starting the press – as well as Joe Ledley, Beram Kayal and in particular Scott Brown. Indeed, it doesn’t appear to be a coincidence that the team’s good form has also coincided with the return of the latter pair. With such players returning to availability, Ki still to return from the Asian Cup and Kris Commons’ recent arrival, there is good depth to the Celtic midfield. Lennon’s transfer strategy for ‘collecting’ midfielders has been questioned by some and the critics may have a point that are there probably too many in the squad at the moment. However, this has given the manager plenty of options to rotate within his preferred four, with the type of individuals selected altering how it performs. At the heart of it are always two pivoted central midfielders – who play in similar fashion to that described in the Zonal Marking article, ‘What does a central midfielder do in 2010?’ – but the wide players can change depending on the opposition. The Rangers game saw Charlie Mulgrew – proving to be a shrewd signing as a squad player – come onto the left side of midfield which added greater solidity. He dealt well with the threat posed by Steven Davis and provided good cover for the swashbuckling Izaguirre while the other wing saw the retention of a more attacking minded player in James Forrest. The controversial draw at Hamilton that followed mistakenly saw the same midfield selection but Lennon appeared to quickly learn his lesson with two attacking wide players selected against a very weak Hibernian and an extremely defensive Aberdeen. The Pittodrie side came to Celtic Park with only one thing in mind – to defend – and strangely continued in this fashion even when a goal behind. It was a game where Celtic needed more width and this came in the form of a genuine winger, Niall McGinn, selected on the right-hand side. His performance left a lot to be desired but the decision to include him is illustrative of the point. There was another midfield reshuffle against Hearts with Ledley returning to form the pivot with Kayal and Brown moving out to the right. This was an interesting tactical decision that was surely made to nullify the threat posed by Hearts’ Rudi Skacel and Lee Wallace. With Brown backed up by the solid if unspectacular Mark Wilson, it proved to be a very good move by the manager. James Forrest switched to the other flank where he faced Eggert Jonsson – a far less of an attacking threat than Lee Wallace – and his pace and direct running troubled the Hearts right-back no end. It was a shame to see Forrest’s game ended so early as the opening goal showed this was an area where Celtic were getting plenty of joy. To say Celtic have become more of a direct side is not entirely accurate because there are still plenty of periods where possession is retained and they patiently wait for an opening. This was particularly true in the Aberdeen game where their ultra-defensive set-up meant Celtic had to take their time when in possession of the ball. However, in recent times we have seen that the side looks to get the ball forward very quickly when the opportunity presents itself. Furthermore, against Hearts the side fired out of the blocks in search of an early goal – reminiscent of the Martin O’Neill era – and were very direct right from the off. This plays well with the deeper defensive line and ‘defensive block’, particularly when Celtic get the opening goal. After taking the lead in the Rangers and Hearts games, Celtic were able to invite the opposition onto them before exposing their high defensive lines – as they pushed forward in search of a goal – with pace and quickly moving the ball forward. A key addition to the recent upturn in fortunes has been the return of the Gary Hooper and Anthony Stokes partnership. The solid platform on which the side is now built has an added ruthlessness when these two are together up front. They have forged a good understanding, with Stokes recently saying, “I think I have a very good understanding with him. In a way we are different players but the runs we make are very similar. I’ve always a fair idea of where he is on the pitch so it makes it easier for me.” Indeed, if one watches them closely you can see that they are always moving as a pair rather than independently of each other and that they look to combine frequently. The front two are an important component of the 4-4-2, both in an attacking and defensive sense as Roy Hodgson and David Pleat discuss in the UEFA Training Ground videos, Hodgson on the 4-4-2 and David Pleat on striker partnerships. “If you play with two of them, you’ve got the added advantage that whoever receives the ball has someone in close support. Also, if you play the ball forward to one the other can threaten the back of the defence, or vice versa,” Hodgson points out. In a defensive sense, Pleat asserts that the front two must, “hold up, as long as possible, the [opposition] back four.” These are things that Stokes and Hooper are improving at and one can see that more games they get together, the more effective and exciting a partnership they can become. Celtic got the three points they needed thanks to a fairly decent performance against a poor, lacklustre Hibs. The home side hadn’t scored a goal in 2011 nor tasted victory since mid-November last year and it showed. This midfield battle is also covered quite well by gibfootballshow.co.uk in their match report of the game. In addition they point out McCourt’s almost total lack of defensive and positional awareness – something we have discussed on here before – which was quite apparent again. He often dropped very deep in search of the ball, in areas where his talent will pose no threat and also provided little defensive cover for his fullback, Izaguirre. Another important feature for Celtic was the return of Gary Hooper to the side and he resumed his strike partnership with Anthony Stokes. We saw last week Stokes struggle as a lone forward – though to be fair he lacked support from midfield – and have yet to see how well Hooper would perform in that role with Giorgios Samaras the only player in the squad who seems capable. Hooper’s return provided the cutting edge, that little bit extra needed to build on the midfield battle won by Kayal and Brown – the first and third a touch of class from Hooper and Stokes respectively, the second a penalty that the Irishman won and tucked away, taking his SPL tally to 43 goals in 72 appearances (7 in 16 for Celtic). Celtic won this game without ever having to get out of second gear but it was a decent, professional job that needed to be done. There wasn’t a great deal of interest from a tactical point of view – the goals coming more from poor defending and a couple of touches of class than anything else – and it was more a case of doing the simple things well. There will be many tougher games between now and the end of the season. Not Used: Smith, Booth, McBride, Nish, Stephens. An injury ravaged Celtic dropped two points after an extraordinary meeting with Hamilton at New Douglas Park where, yet again, the officials were the biggest talking point of an SPL game. Celtic started with a similar lineup to that which won at Ibrox, the one difference being the inclusion of Anthony Stokes in place the injured Giorgios Samaras. This was an injury forced change, with Stokes the only available first team forward and it was to have a big impact on the potency of Celtic’s attack. After a stint at left-back in the Scottish Cup, Charlie Mugrew was moved back to the left side of midfield – where he performed so admirably against Rangers – where he can provide a bit of solidity to the flank where Izaguirre likes to rampage forward. Hamilton went with a 5-4-1, just as they did in the previous meeting between these two sides with the same aim of getting numbers behind the ball when not in possession. Their back five sat deep and were able to spread across most of the width of the narrow Douglas Park pitch. The midfield four sat just in front of them but stepped up to press the Celtic midfield when they had the ball in the Hamilton half. “Every time they step into our half we go and press them”, said the Hamilton boss, Billy Reid. Nigel Hasselbaink was the lone front man and he worked hard all game, closing the Celtic defenders when required but mostly dropping back to supplement his team’s midfield. 1. In order to stop the aforementioned Hasselbaink from being isolated, Hamilton looked to support him from the midfield – aside from one player, who we’ll come to next – but also from players within the back five. The fullbacks were an obvious choice to do this but occasionally you could see centre-back, Simon Mensing, galloping up field. It was a mere footnote in the game however, with Hamilton content to do little of the attacking and the game much more about their defence against Celtic’s attack. 2. One of Hamilton’s midfield quartet, Gavin Skelton, was given an old fashioned man marking job on Patrick McCourt, following him virtually everywhere he went. Skelton did such a good job that it prompted Celtic to switch McCourt with Forrest after roughly 35 minutes. It was a change that freed up the Northern Irishman somewhat, giving him time to turn and face up-field after receiving the ball. He was also able to drift infield in search safe in the knowledge that Skelton would no longer be stuck to him like glue. The injury forced selection of Stokes as a lone striker was out of Celtic’s control but had quite an impact on their attack due to the type of player that he is and the set up of the side around him. He lacks the pace to get in behind defences and usually looks to drop off a strike partner, something that we have seen work quite well with Gary Hooper. Despite this, he seemed to be asked to play a role similar to Samaras’ against Rangers at Ibrox. Stokes doesn’t have Samaras’ pace, aerial prowess or the ability to occupy numerous defenders and this highlights how you cannot simply change one player for another and expect them to do the same job. Stokes needed more support from his team mates and players breaking beyond him but didn’t get this, with the Hamilton centre-backs – containing two spare men – easily forcing him to miscontrol. There were times when he managed to find enough space to take the ball down but the lack of support meant that attacking moves largely broke down. None of the midfield offered the right kind of runs and this shows the thinking behind the signing of Freddie Ljungberg. “We have a lot of midfielders who are quite similar and I think that Fredrik can add another dimension with his running behind the opponent’s defence,” his Swedish team mate, Daniel Majstorovic has recently said. Celtic also failed to get enough crosses into the box, particularly from the fullbacks who, due to the Hamilton formation, were those best positioned to be the spare men in attack. This is not such a significant point given the lack of players getting into the box but on the few occasions there were targets to aim for the delivery was usually poor or unforthcoming. Celtic needed a change and it came through James Forrest moving up front alongside Stokes. He played on the shoulder of the defence, looking to break behind them and this was especially true when McCourt was on the ball. The youngster’s pace presented Hamilton with a different threat and helped to stretch them slightly, opening up space for Stokes. 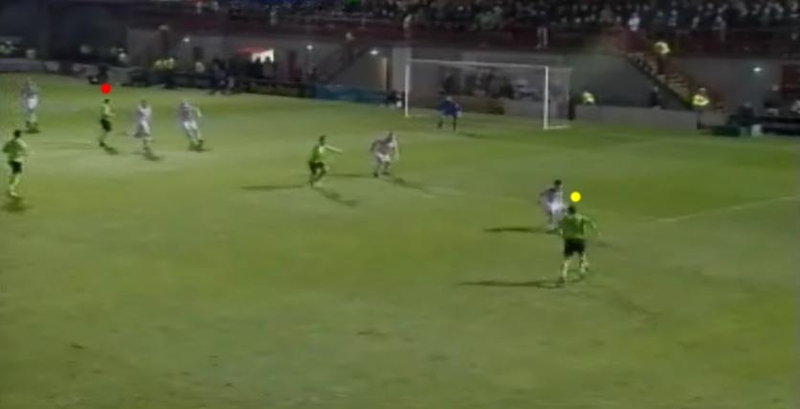 Just moments later Forrest (yellow) again gets in behind the defence after a good through pass from Stokes (red). Flight of ball shown due to difficulty to see ball in this image. Unfortunately, this partnership with was cut short due to yet another contentious refereeing decision when Forrest was sent off after attempting to block a clearance from David Buchanan. Celtic were left with an up hill task and in need of another change which came in the form of Scott Brown in place of Beram Kayal. The Israeli had been one of the better performers, showing good use of the ball and was often the one barking at his team to get things going. Brown’s introduction was possibly to add a bit of bite and energy to proceedings and the tempo of the Celtic’s play noticeably increased after he came on. Hamilton meanwhile, showed the confidence of a side at the bottom of the table and instead of making use of their extra man they seemed to be stunned by the position they now found themselves in. The two sides were numerically evened up a few minutes after Brown came on when fellow substitute, Hamilton’s Jim McAllister, was rightly sent off for a reckless and dangerous lunge on Mark Wilson. It was now ten against ten, giving Celtic the chance to take advantage of the increase in space on the pitch and they responded with the substitution Niall McGinn for Wilson. Celtic switched to a back three of Rogne, Majstorovic and Izaguirre with the latter asked to get forward at almost any opportunity. McGinn came into the right hand side of a midfield three but was given licence to use his fresh legs to support attacks wherever possible, though still get back when the ball was lost. A final substitution – Ljungberg for Ledley – meant another tactical shift with Celtic now deployed in a loose 3-4-2 formation though it was pretty much throw everyone forward when in possession of the ball. Hamilton made little change to their own set up with it just being a case of ‘backs to the wall’ and keep Celtic out at all costs. This culminated firstly through the denial of a stonewall penalty – for which McGinn was wrongly booked for diving – before the referee got a penalty decision right. 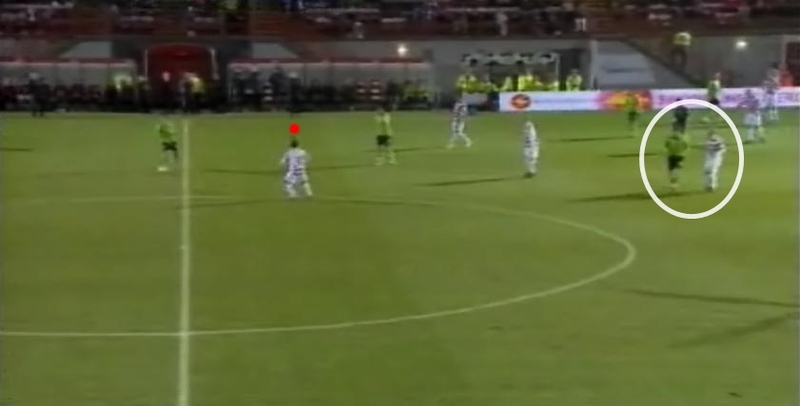 A knee to midriff challenge on Izaguirre in the box resulted in a penalty which Stokes expertly stuck away. It would be impossible to comment on this game without mention of the officials as they probably had as big – if not more than – an impact as any tactical decisions from the boss. That said, Billy Reid must get credit for they way that he set his side out as they really made it difficult for Celtic to create chances. From Celtic’s point of view it was perhaps a mistake to line up in the same way as we did against Rangers and should have altered the way we played to counter the different opposition and to fit the players – namely Stokes – we had available. There’s no getting away from the standard of refereeing though and one can only imagine the distress it can cause managers when it affects the game to such an extent. Celtic have won just one of their last four SPL games, the win thanks to an injury time winner from Gary Hooper. The following two fixtures saw Celtic slip from winning positions to draw at home to Dundee Utd and Inverness Caley Thistle (ICT). The side have displayed an increasing amount of sloppiness to their overall play and wastefulness in front of goal that is reminiscent of last season. Perhaps more worrying is a clear mental fragility – in most ‘big’ games this season Celtic have failed – and this is something that really needs to be addressed. The first of these home game slip ups was against Dundee Utd, where Celtic conceded a stoppage time equaliser for it to finish 1-1. Celtic have the best defensive record (goals against) in the SPL so far this season and this is largely a result of the offensive pressing style that Neil Lennon has introduced to the side. The aim is to win the ball back high up the pitch and as far from our own goal as possible, before the opponents can take it forward into more dangerous areas. Obviously this isn’t always possible as sides are always going to have some kind of possession in your half but the high pressure game has mostly been successful. If the ball isn’t regained deep in opposition territory then the other sides’ counter attacks have often been slowed thanks to the immediate application of pressure on the ball-carrier, giving Celtic time to get into position to close off the passing options or drop back into a slightly deeper defensive block. Most sides have struggled to cope with this with a number of them resorting to panicky clearances or even the possible deliberate surrendering of possession in less threatening areas than their own defensive third. Most of the first forty-five minutes of the Dundee Utd game was no different as Celtic hounded them from the word go, the away side penned in their own half for long periods. Utd also failed to deal with the threat posed from Celtic’s left – the tandem of Maloney and Izaguirre where much of Celtic’s best play has come from this season – and so it was no surprise to see the opening goal come from a combination of this and offensive pressing. After initially working possession up to Dundee Utd’s penalty area, the ball was lost but then swiftly regained – thanks both to a poor clearance from the away side and Celtic’s closing down – and found it’s way to Shaun Maloney who fed Gary Hooper to finish with style. It was an instinctive and excellently taken goal by the Englishman, controlling then striking the ball almost in one movement. Aside from one scare, a breakaway from Utd’s Goodwillie – an example of the high risk attached to a high pressing strategy and subsequent high line – Celtic were largely untroubled. This high riskiness is partly to blame for the criticism – despite their goals against statistic – that Celtic’s defence have received this season. Mistakes are more noticeable and often more likely to lead to opposition chances and/or goals than in a side who defend deep and in numbers giving plenty of cover and who don’t commit as many forward as Celtic do. Often the individual who made an error is directly responsible for a goal being conceded. Despite this, Celtic’s defensive record highlights the strength of such a strategy and if the mistakes can be minimised then we are on to a winner. Furthermore, when Celtic attempt to adopt a more defensive style of play the results have been far worse. Celtic are a lot better with the ball than they are without it – i.e. they aren’t great at defending – and so it makes sense get the ball back quickly before any ‘real’ defending has to be done. Sadly, in the latter stages of the second half against Dundee Utd, Celtic tried to play defensively. Beforehand, Celtic had tried to push on for second goal to kill the game but due to some profligacy in front of goal this never game. The game drifted on and possibly due to complacency the passing and concentration of the side gradually deteriorated, most notably Joe Ledley, whose central midfield position is vital to the team’s recycling of possession. Dundee Utd grew in confidence and sensing Celtic losing their way, started to exert pressure higher up the field. The game was crying out for a change to get the second goal but, for whatever reason, it didn’t come until Celtic were starting to hang on. Samaras and then McCourt were brought on but this did little to help matters, with the latter’s defensive weaknesses being all too obvious. The away side were now really pushing forward and so Juarez was introduced so as to shift to something more like a 4-5-1 with Samaras up front alone, McCourt on the left (therefore Maloney on the right) and Juarez forming a central trio with Ledley and Ki. Celtic retreated deeper, nervously inviting Utd onto them and were eventually unable to defend a corner in the dying moments. The last 10-15 minutes of this game were a good example of why Celtic shouldn’t abandon their usual ‘offensive defence’, as at the moment they simply aren’t reliable enough defensively to retreat and hold a lead. Until this is improved – perhaps with further signings – a 1-0 scoreline is always going to be under threat. Another problem in this game was a lack of pro-activity from Neil Lennon. Earlier in the season, it was he who was making changes in an attempt to correct a scoreline but recently this has been less apparent. He seemed to dally before making his changes too late, after the opposition had made their own and grabbed the initiative – something seen also in the Rangers and Hearts defeats. This may be down to his lack of experience and is could be a cause for concern when facing canny, seasoned campaigners. One hopes he learns quickly. Celtic 2-2 Inverness Caledonian Thistle, 26/11/10: Celtic experiment with back three…then ditch it. When Celtic last used a 3-5-2, most British teams used a 4-4-2 formation but since then more and more sides have adopted 4-5-1’s with a primarily defensive and/or counter-attacking mentality – Jose Mourinho’s legacy? Given this is what Celtic face almost on a weekly basis, it makes the 3-4-1-2/3-5-2 experiment a peculiar decision when taking into account its modern day weaknesses as an attacking formation. Teams still are unlikely to dominate possession in the way Baptista outlines, but even so it was far lower against ICT – 56% for Celtic, a much lower amount than usual at Celtic Park. Indeed, the shots on target count didn’t make for much good reading either, just three in the whole ninety minutes. The first possible reason could be as simple as Neil Lennon looking back to the ‘good old days’ under Martin O’Neill – if it worked then, it could work now. This is probably doing him a disservice as there will surely have been other considerations taken into account, one being the importance of Shaun Maloney in a central role. Maloney’s form has dipped in recent weeks and out on the left he seems unable to influence the game in the same way as he did earlier in the season, when he played centrally between the midfield and attack. In a 3-4-1-2 he is able to return to this role without sacrificing a front two, something which seems to benefit Gary Hooper. The best lone forward Celtic have used so far this season has been Giorgios Samaras, but he is far less clinical than Hooper and so it makes sense to line up in a way which suits your best goalscorer. Unfortunately, Maloney went off injured in the first ten minutes so we were unable to see how the planned experiment was actually intended to work. Instead, we were treated to Paddy McCourt, a player whose fantastic talent is hampered by the fact that the manager’s plans can effectively be thrown out the window. Another (perceived?) benefit from which the experiment was likely to have sprung is the ability to field a third central defender, the hope being that it would give Celtic extra height and stability when defending set pieces – perhaps the Dundee Utd equaliser was still fresh in Lennon’s mind. While this may have helped on that front, it created problems in open play. Initially, ICT looked to sit deep and surrender possession to Celtic’s back-line, meaning Rogne, Majstorovic and Hooiveld were left to start off moves. While all three are fairly composed on the ball, they’re not exactly the type of players you want to bestow such a responsibility to. With the wingbacks pushing on the three centre-backs spread across the pitch, often ending up passing sideways along the their line without really getting anywhere. The other problem in open play was much more so related to the pushing forward of the Celtic wingbacks: on the right Cha pushed very high up-field, leaving Rogne to cover the right-flank; on the left Hooiveld had a similar job though his wingback, Mulgrew, wasn’t quite so attacking-minded meaning the Dutchman wasn’t quite as wide, so as not to encroach on his team-mate’s space. Mulgrew, a player lacking speed and agility, therefore had a lot of space behind him and was also often left 1 v. 1 against ICT’s tricky winger, Johnny Hayes, a player who has troubled him before. Despite all these flaws, Celtic still managed to take a two goal lead, the first a smart finish by Ki which illustrates his growing prominence in attack. He looked more of a deep lying midfielder at first but it would make sense to have someone capable of striking the ball like he can closer to the opposition goal, a goalscoring midfielder something Celtic have lacked in recent years – could he fill that role?. This was one of the few moments Celtic were able to test the ICT goalkeeper and the Korean managed to beat him at the near post after McCourt was involved in the build up. The man who replaced Maloney was given a chance to show he was worthy of more time on the pitch and he demonstrated just why fans want to see more of him with Celtic’s second, yet another dazzling run and finish. He also showed why successive managers have been reluctant to use him more frequently, with little contributed to the side defensively and at times a lack of awareness as to what was going on around him. It’s difficult to believe that with the aggressive pressing style that Lennon is trying to implement that McCourt was given the free role he appeared to have. His natural way of playing and lack of stamina probably had more to do with that and in the second half Celtic were effectively defending with ten men. The change in formation to 4-4-2 enabled him to continue with a similar role but did little to help these defensive problems. The change to 4-4-2 involved youngster, Richie Towell, replacing Jos Hooiveld and lining up on the right of midfield. He is considered a versatile player by the coaching staff but with central midfield as his primary position and this is definitely how he appeared on Saturday. Playing very narrow – almost as third central midfielder – it allowed Cha to continue to burst forward on the overlap. McCourt may or may not have been instructed to play on the left but he continued to come into more central areas in search of ball which made the formation more of a 4-3-1-2. Charlie Mulgrew dropped back into a more conventional fullback position, decreasing the space behind him but the wandering McCourt still left him exposed at times. Whatever the reason that prompted Lennon to ditch the original formation – there were a number of them – the formation had change nothing to do with the first ICT goal. An individual error – one of Celtic’s biggest enemies – let ICT back into the game and just as with the Dundee Utd game the visitors were given the initiative. They took full advantage of Celtic’s weakened defensive unit – McCourt and Mulgrew particularly culpable – and like Utd got the equaliser through a late set-piece. A rough few weeks for Celtic, with some poor form and a noticeable drop in confidence and belief throughout the side. The fragile mentality and/or possible complacency perhaps illustrate the influence Scott Brown has on the team, as this slide in form seems to have coincided with his absence. Of course this is just conjecture but it’s a possibility, despite his flaws he still displays the most leadership out of anyone in the squad. Another argument is that Lennon has made some bad decisions in recent weeks, outfoxed by Smith, Jefferies and Houston, all more experienced coaches who managed to tweak their teams’ systems during games to steal the initiative. The postponement due to the weather could be a chance to regroup and assess what it is going wrong, while the players can have a break from some of the constant pressure to win every game. The good thing is that the season not even half way through, plenty of time to recapture form and make up the difference on Rangers. With Biram Kayal and James Forrest soon to return, the squad will also be a lot stronger in the lead up to the opening of the transfer window, with Celtic surely looking to strengthen further. Celtic bounced back from the defeat at Hearts with a valuable 1-0 win at St. Mirren thanks to a scrappy injury time winner from Gary Hooper. Lennon admitted it was a mistake to split up his strike partnership with Anthony Stokes in mid-week and so the pair were back up front together again. Another reunion was on the right flank, with Cha and Wilson selected at right-back and right-midfield respectively. As in the St. Johnstone game, this really helps to solidify Celtic’s right-hand side and reduces its defensive weakness that was more apparent earlier in the season. In the St. Johnstone game, Wilson didn’t venture forward that often, electing to stay out of Cha’s space but against St. Mirren the pair were far more interchangeable. At times, it appeared as though they were taking turns to be fullback and winger. The other major change to lineup was in central midfield. Ledley’s suspension meant that Juarez was back in the side and this meant a slight change to how the midfield worked. When playing together, Ki and Ledley have fairly similar roles, with slightly more playmaking responsibility falling on the Korean’s shoulders. Juarez likes to play a more energetic role, frequently getting up and down the pitch and can often be seen shifting forwards in support of the forwards. In reponse, Ki played deeper and was much more clearly the player tasked with dictating the tempo and with playmaking duties. He interchanged with his midfield partner far less than when Ledley is selected, would often spray passes out wide and could even be seen dropping into the defensive line to make a back-three while the full-backs went forward. St. Mirren started with a 4-4-2 that sat deep and this gave Ki room to dictate things from the centre of the park. St. Mirren must be given a lot of credit for managing to keep the scoreline level up until the closing stages. They started with a very rigid, disciplined 4-4-2 and deviated from this shape very little. Their players were sometimes dragged out of position by Celtic’s movement but they had the collective awareness to fill in for each other when this happened. Space between the lines was kept to a minimum and this made it very difficult for Celtic to break them down. The likes of Stokes and Maloney struggled to have an impact due to this. The St. Mirren forwards, in particular Michael Higdon, put in selfless, tireless displays and were initially tasked with closing down the Celtic defenders. Boss Danny Lennon must have noticed the growing influence of Ki on proceedings and so around the 20 minute mark, Higdon was told to stay tight on Ki and this made Celtic’s task even harder. This caused Juarez to stay closer to Ki but late on the half they could be seen marked by Higdon and strike partner, Wardlaw. Celtic had a large amount of possession and not much penetration but without the ball they continued their high pressing game. However, aside from a short period of slightly more attacking intent, St.Mirren seemed almost happy to give the ball away in non-dangerous areas. This was largely in the form of clearances up-field either out of play or to the Celtic centre-backs, rather than the greater risk of losing possession in their own half due to Celtic’s pressing. It was going to be a long day for the away side. The second half continued in the same vein, St. Mirren doggedly keeping the scoreline level and defending admirably. At some points their wingers would track Celtic’s attacking fullbacks so far up-field that they ended up in their own backline, making it look like a back-five. It was an almost impenetrable wall and something had to be done so Neil Lennon brought on Daryl Murphy for the struggling Anthony Stokes just before the hour-mark. The playing area had become so constricted by the home side – one could even describe their formation as 4-2-4-0 – that Celtic switched to a more direct and at times, long-ball game game. The usual passing style remained but there were far more high-balls forward once Celtic got up to the edge of the attacking third, mostly aimed at target-man Murphy. It’s not pretty, but sometimes you need this sort of ‘Plan B’ when things aren’t working. If it’s good enough for Spain – in the form of Fernando Llorente – it’s good enough for Celtic. Further changes came, firstly with McGinn replacing Cha – which provided more attacking quality on the right – and then you knew Celtic were desperate as it was time for Paddy McCourt, who replaced Juarez. The ‘Derry Pele’ was fielded on the left and Maloney now moved into the centre as Celtic didn’t really have to worry about defending – it was now simply attack vs. defence. Celtic now had many players forward and lots of width and the more width to Celtic’s play and more variation in attack, the better Ki looks. It gives him lots of options and he has the ability to find them, such as fantastic pass to McGinn who fluffed a golden chance to break the deadlock. Indeed, Celtic were now finally opening up a tiring St. Mirren side and it was only poor finishing that was keeping the scores level. Hooper has no such problem and after a bit of injury time magic from McCourt, the ball broke to him kindly and he tucked it away. The Englishman has saved Celtic a number of times this season and he is fast becoming a talismanic goal-poacher, his late goal bringing a sigh of relief to all those connected with the club.